"Amongst all the wonders of all the wonderful sciences there is no science which deals with such a gorgeous spectacle as is exhibited by the queen of sciences, astronomy, at the moment when the earth is gradually shrouded in darkness and when around the smiling orb of day there appears the matchless crown of the corona." 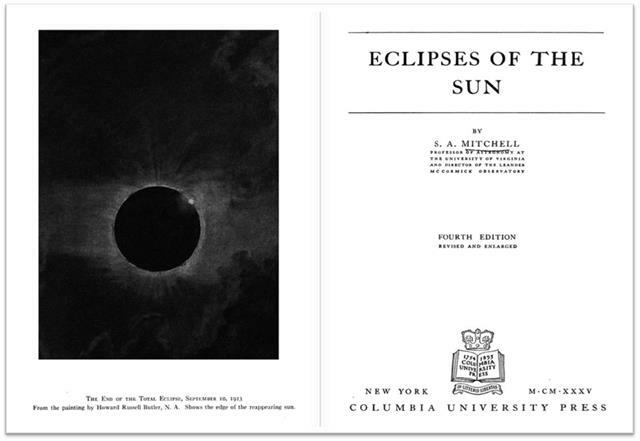 So wrote Samuel A. Mitchell in Eclipses of the Sun in 1923. Back then, few people followed eclipses with the fervor and dedication that we see today. Enthusiasts think nothing of jetting around the world just to witness the few brief moments of a total solar eclipse. And with good reason, for all who behold the majesty of totality will give impassioned testimony to its unbridled glory. A total solar eclipse is the most beautiful and emotionally charged celestial event of all. This month, after an absence of 38 years, totality is finally coming to us -- us as in residents of the United States, that is. On August 21, totality will sweep across the country, from sea to shining sea. Although totality touched the northwestern US in February 1979, and passed over Hawaii in July 1991, the Moons shadow has not crisscrossed the entire country since June 8, 1918! So, this August 21 is a big deal! 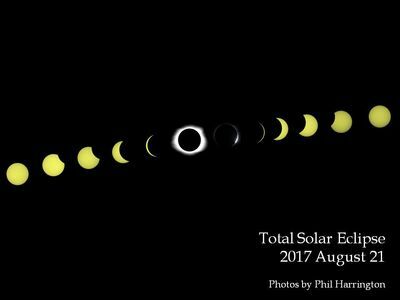 Are you traveling to totality? Or are you lucky enough to live where totality is traveling to you? Either way, there are many spectacular sights to see and do leading up to and during the all-too-brief moments of a total solar eclipse. One thing that has always captured my attention is not so much whats going on in the sky, but rather whats going on around me. If there are any trees in the area, look at the sunlight cast through the branches. The tree's intertwining limbs can act as tiny pinhole projectors to cast a myriad of crescent Suns across the ground. Notice also the changing contrast of shadows cast on the ground. Just as ambient light diminishes during the partial phases of an eclipse, so too may the temperature. Little effect other than normal variances will be noticed at first, but drops in temperature of 10°F (6°C) or more may be felt from the beginning the eclipse to totality. With the temperature dropping and the light diminishing, many birds and are fooled into thinking that evening is upon them. Birds noisily go to roost and livestock have been known to make their way back to their barns, confused about this unusually short day! A minute or so before totality begins at Second Contact, tear yourself away from the Sun and look down toward the ground for shadow bands, faint ripples of grayish light that briskly wiggle across the landscape. The appearance is akin to the ripples seen at the bottom of a swimming pool on a sunny day. Above: Lithograph of shadow bands seen during the eclipse of December 22, 1870 seen from Sicily by Diamilla Müller. 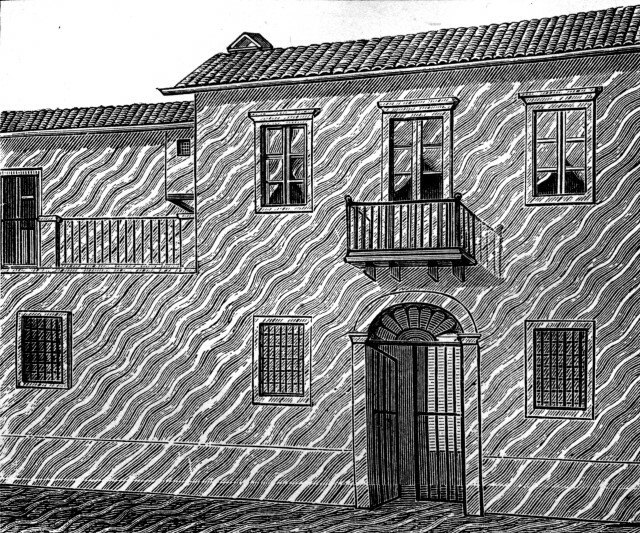 The artist's original caption, translated from French, read "The painting added here, that represents the building on which we saw these shadows, gives a quite weak impression of the phenomenon, which it is impossible to reproduce faithfully, with its oscillations, its vibrations and its quick motion." It is well known that starlight is bent and refracted as it passes through the many swirling warm and cold layers in our atmosphere. Called scintillation, this is what causes stars to twinkle. Sunlight is also impacted by our turbulent atmosphere, though on any given day, the Sun's large diameter and extreme brightness overpowers the effect. But with the Sun sliced to a very thin crescent just before and after totality, its last few rays are twisted and contorted to produce the shadow bands. While it has been assumed for years that whatever caused shadow bands was caused by the Earth's atmosphere, this theory wasnt confirmed until 1986. That year, Johanan L. Codona, then of the La Jolla Institute/University of California San Diego (now at the University of Arizona), published a paper The Scintillation Theory of Eclipse Shadow Bands in Astronomy and Astrophysics 164, 415 - 427. Using computerized models of atmospheric turbulence, he was able to account for their every known characteristic. Spotting shadow bands has eluded many veteran eclipse watchers, while others see them regularly. For instance, during the March 1970 eclipse that passed over Mexico and along the east coast of North America, many saw the bands rippling along the ground. Observing from Virginia, John Bortle of Stormville, New York described the bands as 4 or 5 inches (10 to 15 cm) wide, spaced 12 inches (30 cm) apart, and moving at 20 to 30 feet (6 to 9 meters) per second from southwest to northeast. Others have reported that shadow bands were visible as much as four minutes before totality, and three minutes afterwards. Two-and-a-half years later, while viewing the 1972 July 10 eclipse from 9,000 feet (14,000 meters) over Baker Lake (Northwest Territories, Canada), veteran eclipse-chaser Jack Newton took a remarkable photograph of shadow bands dancing on the wing of a DC-3 aircraft. The image below is reproduced from my book Eclipse! (John Wiley & Sons, 1997). 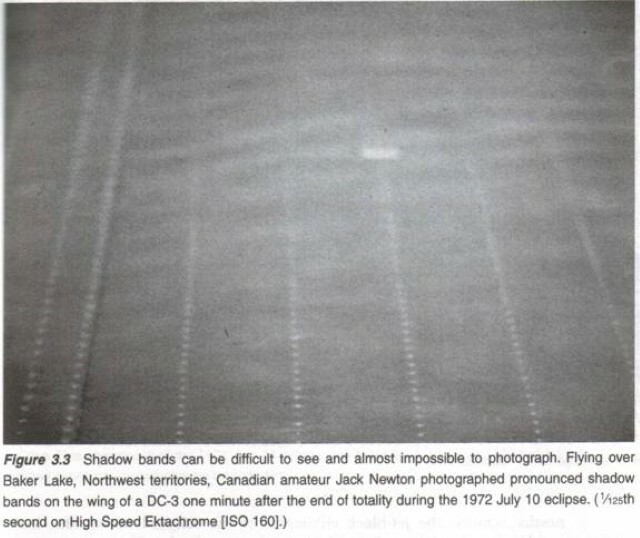 Above: Shadow bands, as photographed by Jack Newton. The greatest problem in viewing shadow bands is their low contrast against the ground. Many find shadow bands easier to spot against a white sheet laid flat on the ground. They are also more difficult to spot if the sky is anything but crystal clear, though they have also been seen under less than ideal sky conditions. If you are successful in spotting the bands, be sure to announce your observation loudly enough anyone nearby to hear. Better still, set up a video camera and try to capture them for posterity. But do not become so consumed with looking for shadow bands that you miss other spectacular events such as the forthcoming Baily's Beads or the diamond ring! I have to close with a story about my own experience with shadow bands during the July 1991 total eclipse. I was part of a tour that traveled to La Paz, Mexico, at the southern tip of Baja California, to see the event. Totality went right over our hotel, but being typical gluttons, many of us went on a charter bus for a long, very rough ride into the desert to get maximum totality, 6 minutes 57 seconds! Our tour leader set up our viewing area several miles east of a mountain range. There wasn't a cloud in the sky. At first. As the eclipse progressed, the temperature not unexpectedly began to drop. Despite the hot, dry conditions, the dropping temperature caused wind currents to pick up, with the cooling air apparently causing downdrafts off those mountains, forming clouds! Long story short, totality was clouded out halfway through! Meanwhile, those folks who stayed back at the hotel, not only did they more of totality than we did, all while sipping adult beverages while poolside, they also saw very distinct shadow bands! We did not. Above. 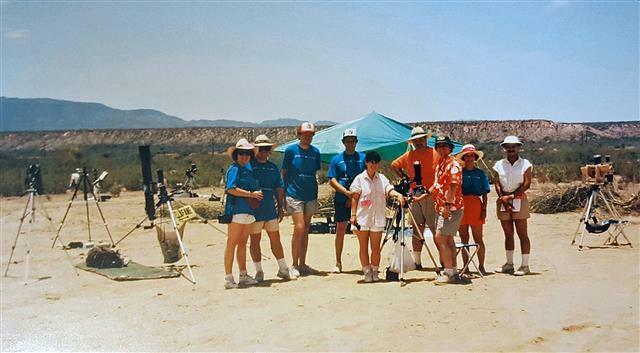 Our pack of desert rats awaiting totality during the July 1991 eclipse. Yours truly is third from the left. One final word of warning. Dont make the mistake of seeing totality through your cameras viewfinder, squandering your time in the Moons shadow trying to get that perfect photo. Let others do that. No image ever captures the emotion of witnessing the totality of totality first hand. There are so many spectacular sights to experience during the all-too-brief moments of a total solar eclipse that perhaps the greatest challenge of all is simply seeing the eclipse. Have a favorite challenge object of your own? I'd love to hear about it, as well as how you did with this month's challenge. Contact me through my web site or post to this e-column's discussion forum. Remember, half of the fun is the thrill of the chase. Game on! Thank you for posting this, Phil. Now I know what to look for, and will make a point to look down when tempted to be looking up. I didn't manage to see the shadow bands, but it was mostly cloudy (there were flashes of lightning a few miles away during totality), so I don't feel too bad. I will try again in 2024. I set up a camera to record video of our group experiencing the eclipse. We were looking up as totality neared and didn't notice very obvious shadow bands flowing around us. Luckily, just as totality ended, my wife noticed the shadow bands, although faint, and called them out. Reviewing the video later, we saw that the bands were much more distinct just before totality than after. My boy and I spent the night on the Snake River in Idaho/Oregon border area near the central zone. I told him about the bands. A few minutes before totality we notice a funny site on the water. I will try an post my videos. the current is running right to left roughly east to west. The bands appeared perpendicular coming across the water toward shore. Initially it looked like true water waves but we noticed on closer inspection this was not the case. My cell phone easily picked up the cool phenomena. I am not able to upload them but will try and figure out a way to do it. Woodscavenger - Those are some neat shadowbands!! I'm having trouble playing them on Flickr due to hesitations in the play back; can you upload to You Tube? I saw the eclipse from Indian Boundary, TN with friends, family, and complete strangers. My sister-in-law spread two tablecloths on the ground with the white undersides up to catch the shadow bands (some people call them shadow snakes). We saw the bands quite clearly both before and after totality. We could even see them on the grass and dirt around the tablecloths. My friends J and Jo Perez viewed the eclipse in SC and Jo made this video of the shadow bands. It's best seen in dim light. I was at the State Fair grounds in Columbia South Carolina and I saw them about 1 minute before totality. "Shadow Snakes" is a better description..
We drove from NY to Madisonville TN. I borrowed a white towel from the hotel. At about 30 seconds before and after totality, the shadow bands were clearly visible. I did not take any videos or photos on the advice to "take the first one in with your eyes and brain only". Yes, this was my first total eclipse and i can not wait until 2024. I'm glad to see that so many were successful at meeting the challenge of seeing shadow bands. Alas, I did not. We were in Clarksville, TN, and while conditions were perfect, the bands evaded us. Thought I'd add here a montage of the event that I assembled from images I took through my C6 SCT. I'm very happy with the result, but even happier that I experienced the eclipse by seeing it. Photos are nice and all, but none will ever capture the pure emotion of the event.